All around the world, we have different words for naming a bathroom sink. So, we have something that could be defined as washbasin – "installation used for washing people’s hands" named Lavabo in Italian or French. Therefore, starting from foreign nomenclature that separates “installations for washing hands” depending on installation site, we need to differentiate between Bathroom Sink, as in something used particularly in bathrooms and Sink as a dishwasher in the kitchen / garden washer. Moreover, besides the already mentioned French terms we have the German word "Waschtisch" as in bathroom sink and respectively "Kuchenspule" as in kitchen sink. Installations for washing hands are called “hand washbasin” or “Handwaschbecken” and “lave-mains”. As a conclusion, throughout this article we will use the term Bathroom sink for the bathroom. • ceramic ware – obtained by pouring a mixture based on clay in shapes, later followed by heat treatment in special ovens. Mainly white, the obtained product are durable, easy to maintain and upon request, can benefit from a special design. This is the standard material for sanitary ware. 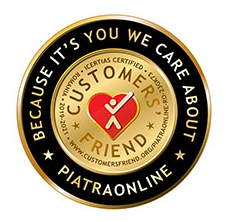 • porcelain ware – more efficient compared to ceramics and similar production technology. Yet, higher prices compared to ceramic ware. • glass – a fresh material in this industry; able to deliver transparent and colourful products. Quality below ceramic ware. • composite – mixture of minerals and resins, with an exterior look that is no match for the elegance of ceramics or porcelain. The option of colored products comes as an advantage. • natural stone – a product obtained by mechanical processing of an environmentally friendly, durable and beautiful material. 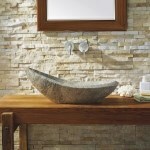 All natural stone bathroom sinks are unique, since we are talking about a one of a kind material. • metal – bathroom sink from enameled steel, stainless steel, even copper, manufactured with mechanical processing technology by bending, punching, pressing, galvanic coating or with enamel. A good example for this is the old cast iron sinks from your Grandma. • freestanding bathroom sinks – the old models of bathroom sinks, wall mounted and carried by semi pedestal from the same material as the sink. A drywall is fine for this type of sink, sink faucet is installed on the sink and you have also an overflow. Connection to water utility requires two hoses. Sink cutout is made during processing, for facilitating installation. There are also sink models with pre-punched outline for the cutout. Siphon is installed in the lower area, where draining takes place. • wall mounted and semi pedestal bathroom sinks – the new models, in which the semi pedestal (from the same material as the bathroom sink), is designed to conceal the siphon. The semi pedestal is attached to the bathroom sink, but there are also wall mounted models. For the semi pedestal models, you need to have a masonry was (drywall is not recommended). This type of bathroom sink is installed exactly like the freestanding bathroom sink type. • bathroom sinks installed on brackets – when wall is not steady and thus unable to uphold the weight of bathroom sink (drywall). Brackets are from chrome plated metal. Installation includes positioning of bathroom sink on the brackets, connecting it to water supply and installing the siphon; brackets are attached to the flooring and onto the wall as well. Usually, sink faucets are installed over these bathroom sinks. • bathrooms sinks with stand unit – designed for projects with drywall support wall. Behind the wall you have a metallic bracket, attached to the flooring and/or adjacent metallic structure. The bathroom sink is installed on this stand. • vanity bathroom sinks – special structure for matching the furniture underneath. These sinks are not wall mounted, only attached and connection of inlets and siphon uses the standard installation procedure. Usually vanity bathroom sinks have the sink faucet installed over the sink. • vessel bathroom sinks – installed over the countertop, usually without overflow and no coutout for sink faucet. Vessel bathroom sinks are wall mounted or over the countertop. The latter are installed only after making the cutout. • recessed bathroom sinks – have protruding edge and are installed from top to bottom by cutting out the countertop. The cutout is narrower compared to sink’s diameter so that it can be placed over the countertop, while supported by the edge. Sink faucet is countertop mounted or wall mounted and siphon is only connected with this sink. The contact area between bathroom sink and countertop is sealed with sanitary sealant. • undermount bathroom sinks – installed under the countertop by bonding the countertop cutout. Adhesive must be strong and waterproof. Cutout can be round, square, rectangular or oval shape. This bathroom sink has wall mounted sink faucet or countertop mounted sink faucet. • semi – recessed bathroom sinks – special structure bathroom sink, with two areas of different thickness, installed partially on the stand unit and partially on the countertop. 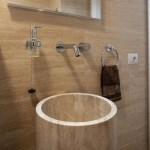 • corner mounted bathroom sinks – with special shape that allows to be installed in a corner. Sink faucet is installed over the sink and attachement is wall mounted. • double sinks – two bathroom sinks processed from the same large piece of ceramics. It is wall mounted on masonry wall. • floor standing bathroom sinks – large bathroom sinks installed directly over flooring; sink faucet is wall / floor mounted. Water connections (inlet and drainage) are concealed. • commercial bathroom sinks – usually made from steel sheet and recommended for public areas with mixed traffic; wall mounted on masonry wall. • poured in countertop bathroom sinks for public use – processed by distorting a countertop sheet and resulting in a bathroom sink that is an integral part of the countertop. • bathroom sinks for residential use – usually made from natural stone, enameled steel or sanitary porcelain (including vessels and recessed types) and porcelain ones, with heat treating for easy aftercare ("Wondergliss" technology). Besides being quite expensive, additional benefits include special design, durability and longest lifespan. • bathroom for apartments and low traffic public toilets (bed and breakfast facilities, museums) – made from sanitary ceramics, acrylic, composite materials or glass. Vanity bathroom sinks are still available, with a design that allows large scale industrial production. • bathroom sinks for public toilets with low, medium or heavy traffic and mixed users (offices, schools) – similar with sinks for apartment bathrooms. Models have common design and you can also use poured in countertop bathroom sinks. • bahroom sinks for heavy traffic public toilets and mixed users (malls, hospitals, airports, train stations) – produced from ceramics, acryl, sheet iron, molded bathroom sinks. • bathroom sinks for high risk public toilets (from prisons, correctional schools) – made from thick steel sheet. • hotels bathroom sinks – made from sanitary ceramic, yet depending on on hotel ratings, can be also made from expensive materials and finishes. • bathroom sinks for disabled persons – special bathroom sinks with specific shapes and sizes; made from sanitary ceramics and installed in toilets designed for disabled persons. • bathroom sinks for nursing homes and elderly people – produced from special sizes sanitary ceramics or steel. Bathroom sinks have different shapes and sizes depending on the use and material. Bathroom sinks from ceramic and sanitary porcelain have round, oval or square shape, the most popular being, medium size of 600 x 460 mm. Vanity bathroom sinks are usually rectangular. Small size bathroom sinks and corner mounted sinks can be include in the washbasin category. Vessel bathroom sinks have round, oval, square and rectangular shape, but the most popular is the round shape. Recessed bathroom sinks have usually round, square or rectangular shape. Iron sheet bathroom sinks are usually rectangular. Usually, it depends on material, technology and size of the manufacturing series, sizes, shape and obviously design. Ceramic sinks produced by casting can have affordable prices only if the manufacturing series includes hundreds of units. Porcelain sinks are more expensive because of the material. Composite materials bathroom sinks have mixed prices. Handmade products obtained by mechanical processing (e.g. 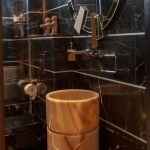 copper bathroom sinks) and quantities of several units will be more expensive. 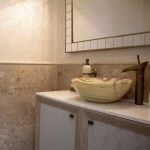 Natural stone sinks installed on countertop will have average prices. Designer of a manufacturing series will establishes not only the shape and look, but also the price. Therefore, products from famous design houses will be more expensive. Also quite expensive will be he bathroom sinks for disables persons, considering that technology and manufacturing series are different from those of standard sinks. 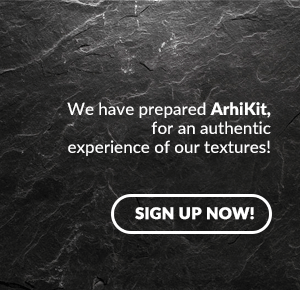 The aftercare depends on material, shape and installation site. The "Wondergliss" technology for sanitary porcelain bathroom sinks repels water from the surface, are very glossy and water glides quickly over the surface. As a result, aftercare is easy and cheap. The aftercare of ceramic sinks is more difficult, yet associated costs are moderate. These two types of sinks are not sensitive to staining nor scratching and do not withstand strong blows. Transparent glass bathroom sinks needs constant aftercare, because can be stained easily and are also sensitive to blows. Aftercare of metal bathroom sinks is simple, yet is more difficult to clean joint corners. Acid staining agent can easily stain stainless steel surfaces. Composite sinks are stained easily, so the aftercare is more complicated. Most of the sinks are white and have glossy finish. Because of this finish, surface cleaning is easier. Sinks with matte finish (especially in composite ones) require more aftercare. Natural stone requires waterproofing for maintaining its original appearance. All modern designers created manufacturing series to match the sanitary ware from your bathroom. These series usually includes bathroom sinks, toilets, bidets and sometimes sink faucets or accessories. We recommend using sanitary ware from the same series (same design) in your bathroom. 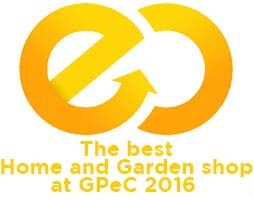 For standard decoration projects there are no such strict requirements. Sink faucets are made of chrome plated brass, with a design to match the sanitary objects. The bathtub and shower cabin maintain the main design line and sink faucets are from the same family as the bathroom sink. Choosing a bathroom sink is essential for your bathroom, because such a simple sanitary ware can transform the ambience, by turning it into a relaxation area. Then, also important is the material and you should consider natural materials for a long-term investment. 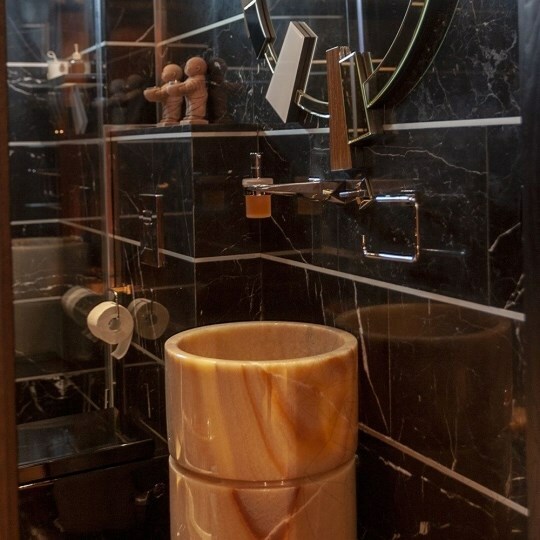 Using sanitary ware from natural stone is not new, considering that in the beginning, this was the material of choice for shower trays, toilets and bagthroom sinks. 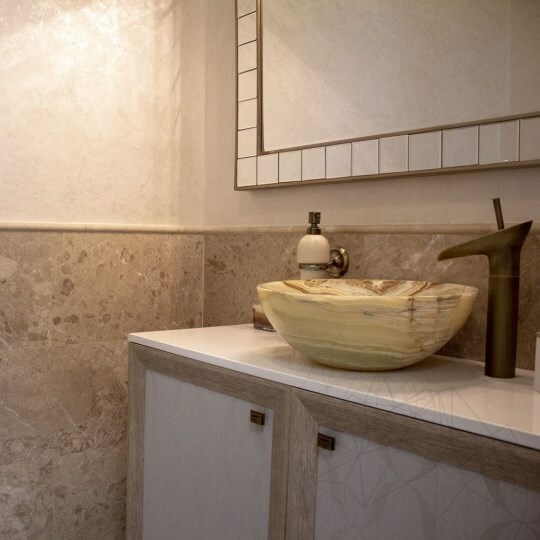 A bathroom decoration project with natural stone has to follow a set of requirements, such as: slip-resistant and mold resistant features, light weight for avoiding the overload of underlay and a stain resistant surface. Before reviewing some design suggestions for decoration project of bathrooms with natural stone, we need to clarify the "luxury" expression. Although, in most cases, the word "luxury" is automatically associated with expensive materials, this is not always true. A luxurious design that impresses with a high class look does not always involve expensive products, unreachable for many of us. One of the misconceptions regarding natural stone floors is the slippery aspect, which qualifies them as unsuitable for bathrooms. However, such a misconception is based on a fact: it is recommended to avoid installing glossy natural stone (with polished finish) in bathrooms, unless treated according to the description below. So a polished surface becomes slip-resistant with special treatments, while adding personality and making the bathroom more elegant. Small bathrooms decoration project need maximum two colors or two shades. 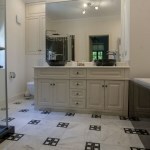 If larger areas promote chromatic contrast, for smaller bathrooms it should be avoided strong opposition between colors. Because of this, wall claddings are made with natural stone having monochromatic texture or warm soft shades. “Fantasy” design style allows stronger color scheme and diminished vibrations. Small bathrooms will always be a space dominated by moderate color mix. Our bathroom sinks have veins, no cracks!